← Mad Hatters Hen Party Photos! 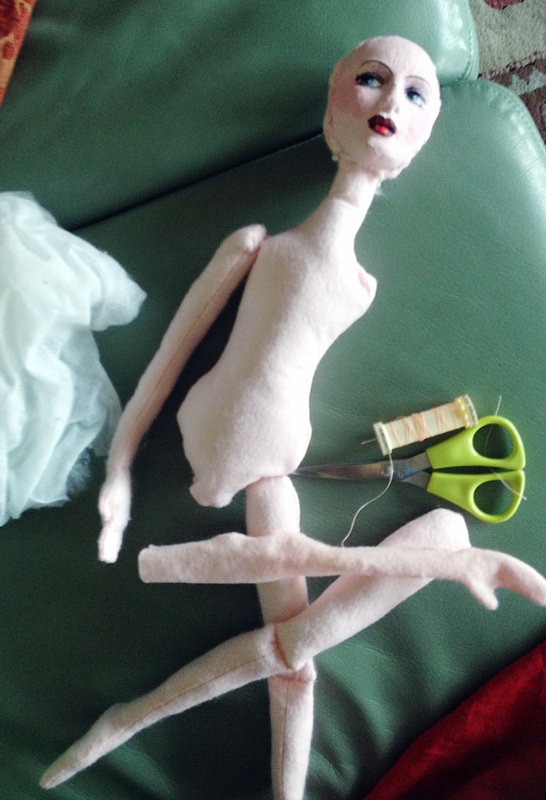 Anyway, because of the price of the nicest examples of boudoir doll, I decided to try making my own. I adapted a pattern I found online for the limbs and torso, creating the alien-like body from felt. 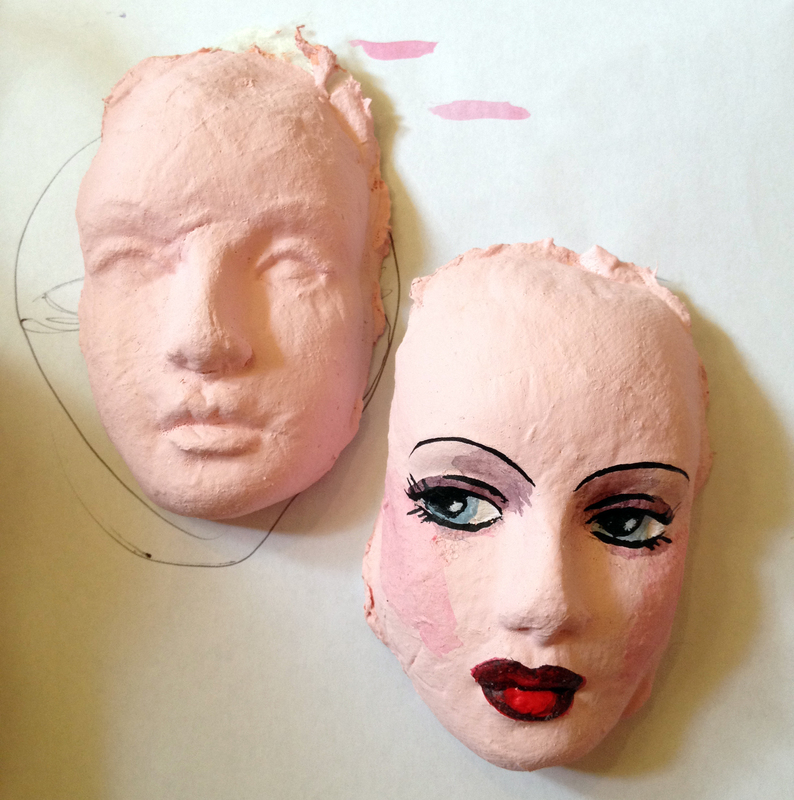 I had great fun doing the face and used a doll face mould and cotton wool pads dipped in watered down PVA glue! Once dried I painted with acrylics. The texture of the cotton wool pads has given the face a wonderfully old look. I didn’t want this doll to look brand spanking new, I much preferred a more ‘look what I just found in this old attic trunk!’ look. I originally wanted her to be lounging in lingerie and a Chinese silk robe, but unfortunately we mislaid the bag of silk remnants! I managed to create some French knickers out of two tone silk with old lace trim and a bra top to match. Because these dolls have iconically long limbs, she looked a little disturbing with no hair and more like something from Close Encounters as opposed to Brief Encounter. 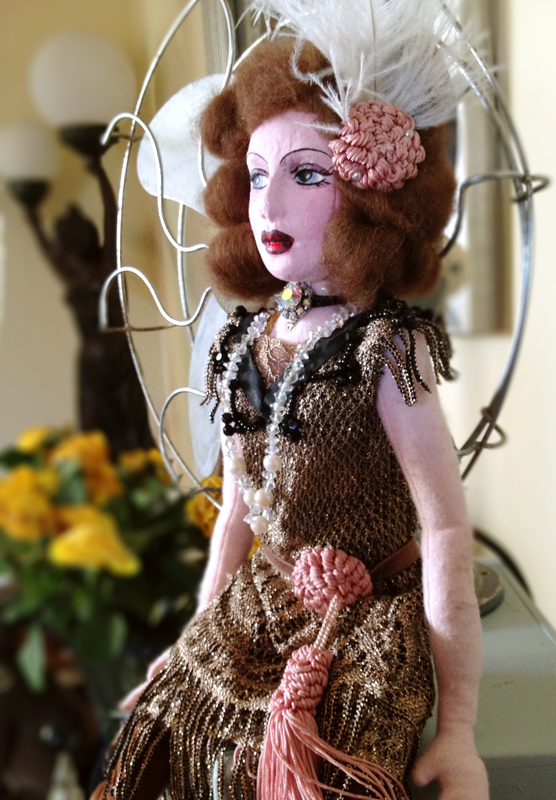 After checking my scrap fabrics, I came across an old dress of my sisters with a great crochet overlay and tassels, which lent itself beautifully as a flapper dress! I used an uphostery tassel and beaded trip as decoration and made a long necklace out of some 1930’s and 50’s beads I had lying around. The choker is the clasp from a pearl necklace that exploded a few years back. The stockings are made from one of my own seamed nylons that laddered and look aged and tattered as if she has been dancing all weekend! The hair made all the difference and is beautifully soft alpaca! 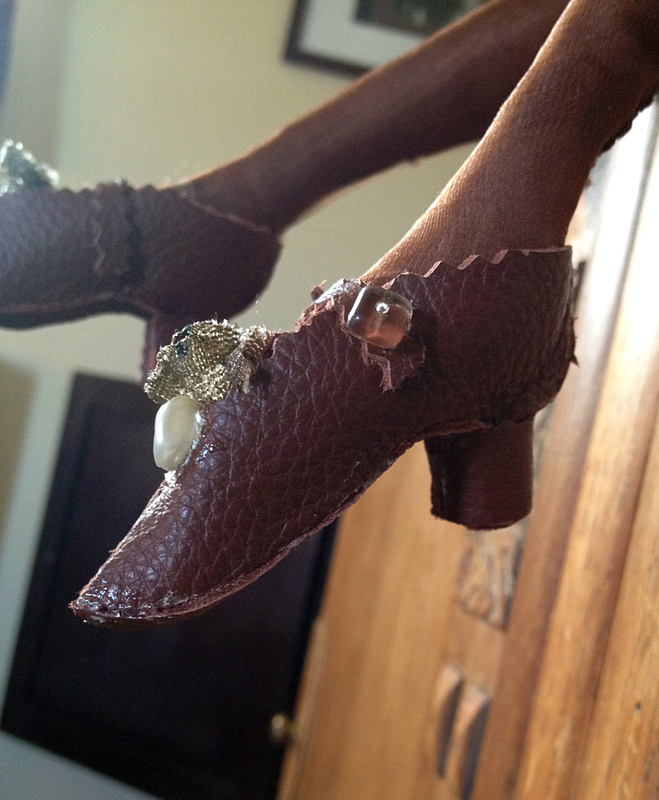 As a finishing touch I made her leather shoes from a sample swatch and a couple of antique pearl beads. Her hair is slightly more ‘poofy’ than I originally wanted, but as my first try, I am very proud of her! 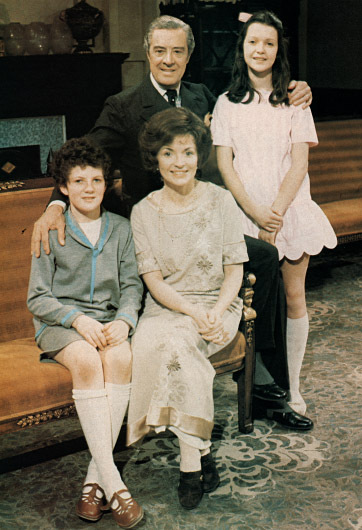 She reminds me of Virginia from the 1971 Upstairs Downstairs. What was it with 1970’s period dramas where they would sneak in the bouffant hair do wherever they could get away with it?! Posted in Arts and Crafts, Home and Leisure and tagged 1920's dolls, 1930's dolls, antique dolls, bed dolls, bedroom dolls, boudoir dolls, doll clothings, doll costumes, doll crafts, doll faces, doll making, doll masks, doll shoes, dressing table dolls, flapper dolls, kitten pinup, kitten von mew, kitty meow, making boudoir dolls, upstairs downstairs, vintage dolls, vintage girls, vintage pinups. Bookmark the permalink. She’s fantastic! Now I want to try to make one. That mohair would lend itself nicely to a Clara Bow style! Yes! 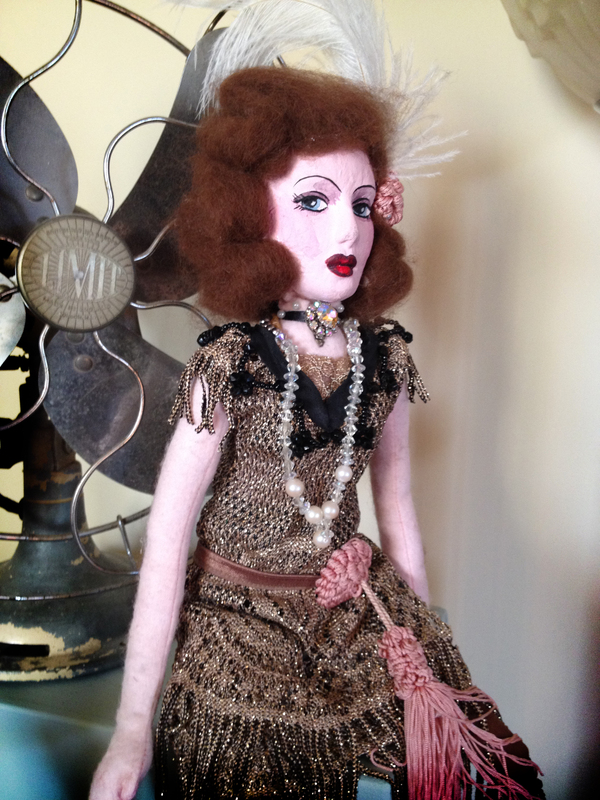 I was going to get some of the curly wool to try something similar as that has a good finger wave look to it! Thanks Marie! Weird isn’t it, I guess things don’t look so scary when you make they yourself as you bond with it in the process.